Happy almost weekend! I’ve come down with a summer cold, so I’m stepping up my eating habits to nourish myself back to health. Nothing helps kick an icky illness better than eating right and resting. The body needs real food to recover! Sunday night, when I felt this one coming on, Georgia and I grabbed the last lettuce from the garden and some fruit from our weekend grocery haul, and got down to business. This smoothie is refreshing, re-hydrating, energizing and nutritious. Sip happily! Using a fresh banana is fine, too. You may want to add a couple ice cubes to keep it cold if you do that. Subbing a lime for the lemon is also OK; you can also swap the romaine for any kind of lettuce, and any type of apple will do. This is a flexible smoothie that tastes sweet, not super green. My only advice would be to keep water as the base or it will get too heavy and won’t have the same smooth drinkability. Adding the water, lemon juice and watermelon first, then the other ingredients, blend on high until smooth. Enjoy cold! Keeps well for up to a week in the fridge, or double and freeze extras to have throughout the week. It’s strawberry season in New England! These berries have a very short window of availability each year, and this summer the crop is peaking late — like right now — so it’s time to pick up some fresh berries at the farmer’s market and get baking. 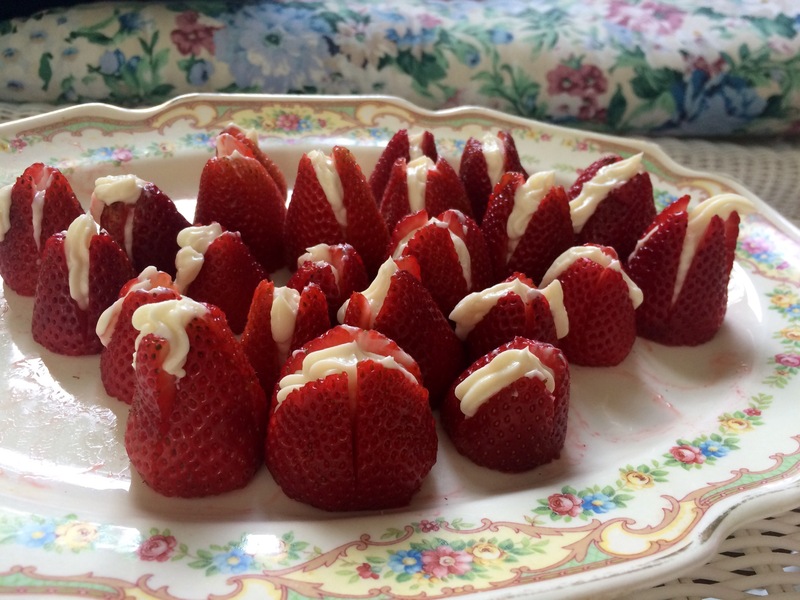 My brother’s girlfriend Michelle, who you may remember from this popular Stuffed Mushroom recipe at Christmas, makes one of the best strawberry treats I’ve ever had: strawberries stuffed with sweetened cream cheese. Auntie Shelly, as Georgia calls her, brings these to every summer gathering and they are always the absolute most popular item on the potluck, including last weekend when we had a barbecue for Mark’s birthday at our house. They were gone in a flash and I felt lucky to grab a couple before they disappeared. In addition to being a crowd pleaser, they are very simple to make. Read on to find out how. First, take the cream cheese out of the refrigerator. It needs to be at room temperature in order for everything to blend well. 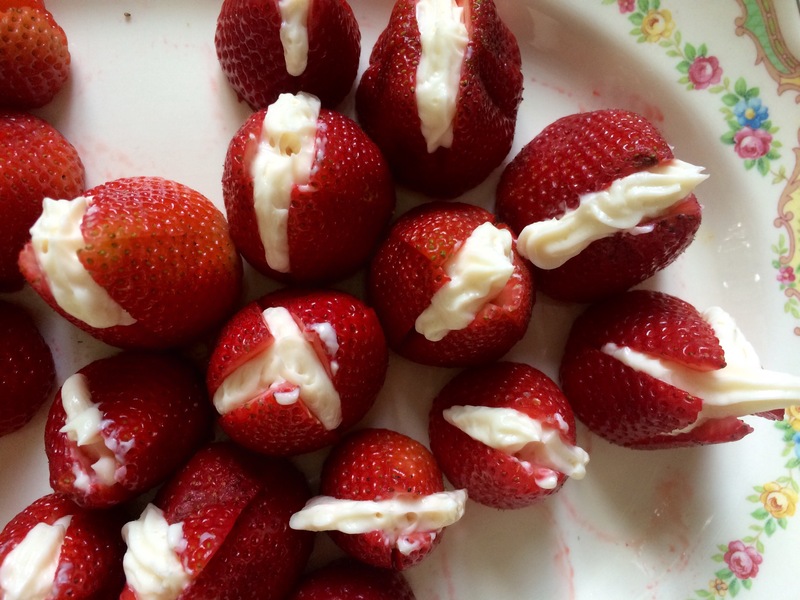 Wash the strawberries, and remove the stems. Cut the bottom off of each strawberry where the leaves are so they can stand up on their own. 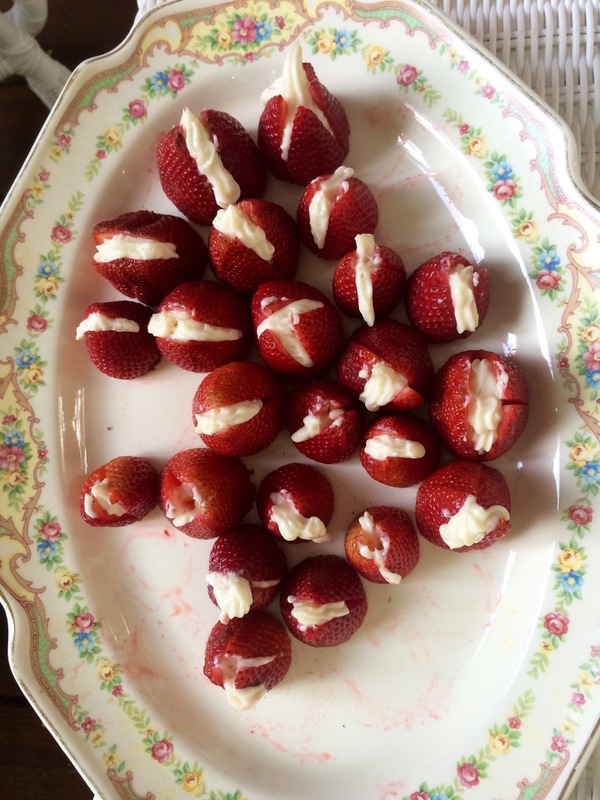 Make an “X” cut on the pointed side of each strawberry and set them aside. In a large mixing bowl, add all the ingredients and start mixing on low speed. Start slow to make sure the confectioner’s sugar doesn’t splatter everywhere! Increase the speed to medium/high until the mixture is a light, fluffy texture. This usually takes about 3-5 minutes. Put the cream cheese mixture into a piping bag with a small tip. An easy way of doing this is to use a tall, empty drinking glass, which holds the bag so you can have both hands free when pouring the mixture. Insert the piping tip into the middle of the “X” cut on each berry, and squeeze the filling in until you can see it starting to peek out the sides. Finally, an optional last step is to put some crushed graham crackers on top of the berries. This can make them look extra fancy! If you really, really love strawberries — as Georgia does — try these Strawberry Mini Muffins, my Strawberry Rhubarb Crumble, this Strawberry Yogurt Cake or my Creamy Strawberry Smoothie. 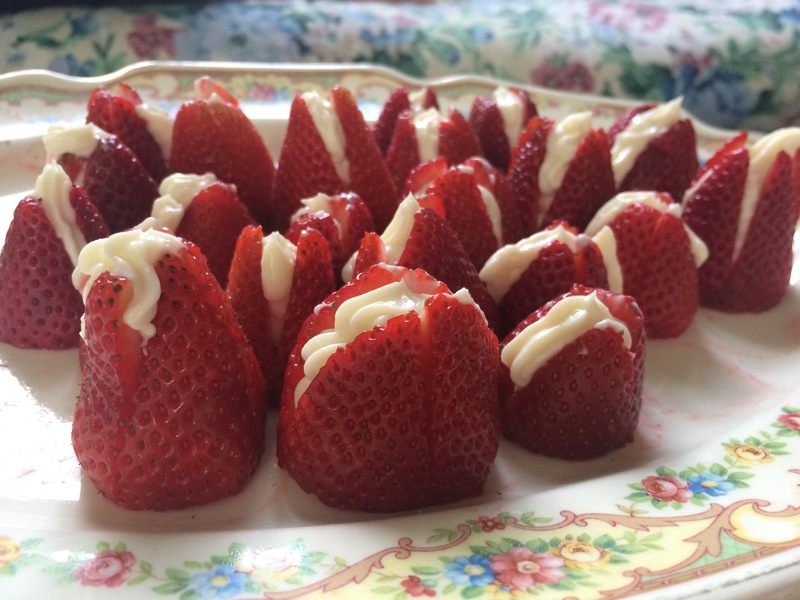 We really love strawberries in our house! Looking for places to pick your own strawberries this month? Here’s a great guide to you-pick spots and local strawberry festivals in and around Boston in June. Or, just follow the Facebook and Instagram posts from your family and friends for of-the-moment tips. Happy picking! We had a little makeover here on the blog — hope you like it 🙂 Leave me some feedback in the comments below! I’m all done with Mark’s Father’s Day gifts, and because his birthday is the day before, we are going to have a cookout at our house to celebrate this weekend. Also, we are going to a wedding on Father’s Day! Crap, I just realized that means I need to find a fancy dress for Georgia (and me) to wear. She’s also starting preschool the next week (eek! how did that happen so soon??) so I REALLY need to exercise my plan-ahead mom muscle. If you’re still looking for gift ideas, and the dad in your life neither golfs, wears a tie every day or likes to BBQ already has all the grilling tools under the sun, here are a few ideas even picky fellows like Mark — collector of musical theater cast albums, books about the American Revolution, and ridiculously expensive PC games — would enjoy. I’m forever teasing Mark about the time he lost my really expensive (and amazing) hot/cold thermos from Japan. Gift one with some of his favorite tea or coffee! Same goes for stainless steel drinking cups, which are reusable, odorless, unbreakable and easily washable by hand. Pair with a favorite beverage, and you’re all set. These performance stretch t-shirts are literally all Mark wears, and he (like most of us) is obsessed with the stories behind the making of Hamilton. These cuff links and smart phone photo lab are just a little bit unexpected and fun. Jennifer Lee’s Gourmet Bakery: BBQ themed cupcakes, plus 30% off hot dog burgers and buns, 6/15-6/19. Massachusetts Wine Shop: Hosts an “On the house wine tasting” with Dad on Father’s Day Sunday. Peterman’s Boards and Bowls: Handsome, hand-crafted wood bowls, great for a healthy appetite! 20% off 15″ and larger wooden bowls, 6/15 – 6/19. Red’s Best: For every $50 gift card purchased, receive $5 bonus bucks free. Wolf Meadow Farm: Cheese Basket for Dad including scamorza, caciotta and surprise 3rd cheese, plus wine jelly & spreader: $35 with mention of Father’s Day promotion, available through 6/19. Red Apple Farm Presents Apple Butter Glazed Pork Chops (in the KITCHEN; Friday, June 17, 1:30-2:30pm): Learn how to make pork chops glazed with Red Apple Farm’s apple butter and you’ve got a special meal planned for Father’s Day. Father’s Day BBQ Bites (in the KITCHEN, 11am-4pm): On Sunday, enjoy activities for families and children of all ages, including crafting a gift for dad and hands-on gardening, cooking and baking activities, such as how to make BBQ sauce. $25. Work is crazy these days, and I’ve noticed a distinct uptick in the number of people dropping by my office to dip into the candy bowl I keep on my desk as a result! I have an assertive sweet tooth myself, and am always battling to keep my sugar intake in check, especially during times of stress. As a mom, it seems like I’m always reading articles about how much sugar sneaks into our food and feeling as though I always have to be on guard, reading labels, and watching my family’s intake of junk food. Added sugar shows up in salad dressings, ketchup, many breads, spaghetti sauce, granola bars, cereal, canned fruit, and of course in candy, cookies and juices. My personal downfall has always been candy and sweet drinks, in particular lemonade (ok fine, and white wine!) and I’m sorry to say I passed this right along to my kid! Nothing is too sweet for her, but we try to limit her to one small organic juice box per day, with water as her only other drink. To keep my own snacking in check, I try to make sure I stay hydrated with seltzer or filtered water with lemon or lime in it, and I surround our whole family with healthy, filling snacks, like pre-packaged, roasted nuts, hummus with veggies and pretzels, string cheese, green smoothies, overnight oats, Greek yogurt and fresh fruit. When that snack-y sweet tooth strikes, I try to keep myself away from the candy dish by adding fruit, granola, or honey to Greek yogurt. 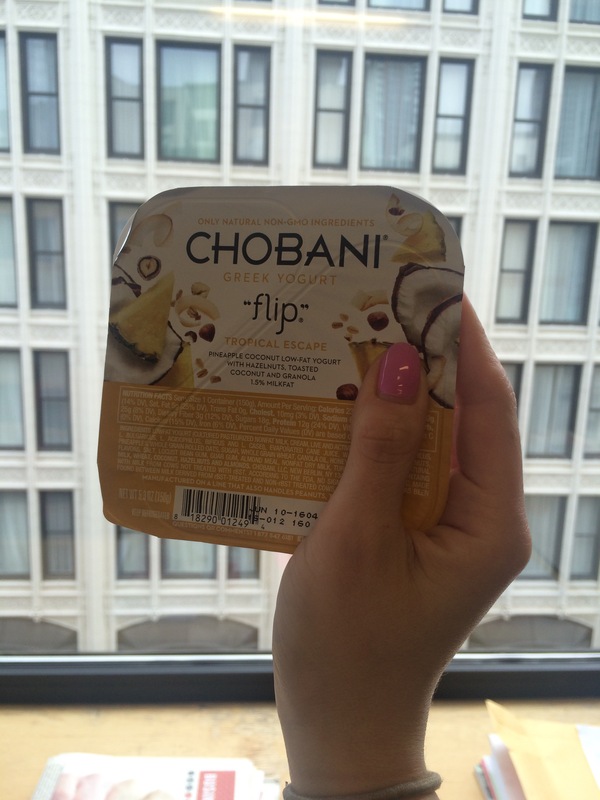 Or, I pick up one of my new favorite indulgent snacks: Chobani flips, which pair low-fat Greek yogurt with a little sidecar of treats, such as coconut, granola, dried fruit, nuts and dark chocolate, and you can flip the entire thing in or add just a little hint of decadence. They recently shared this fun flow chart to help you find your own flavor soulmate. Mine came up Sweet n’ Sweet, no matter where I started at the top! (My favorite guilty pleasure, by the way, is hands down tacos. And I like to put fried fish, shredded purple cabbage and diced avocado in them, drizzled with lime juice!) Boy, have they got me pegged. New obsession alert: this is currently my most favorite smoothie in the world, which is saying a lot because I make a lot of smoothies (in fact, Georgia now asks me every night, “are we going to make smoothies with the Vitamix together? !”) This one stands out because it is so refreshing and hydrating. I’ve been battling the worst allergies this spring, and the fruit and coconut water in this drink do wonders for my raw throat. On a couple of those hot nights we just had, I swear I could’ve just had this smoothie for dinner. Enjoy! Adding the liquids first and the frozen ingredients last, blend on high until smooth. Enjoy cold! This made enough for two large smoothies so I set one aside and just gave it a good vigorous shake the next morning to re-mix it together. Or, you could freeze any extra, or halve the recipe and it will turn out the same.You can also adjust the coconut to regular water ratio: I happened to buy about a 12-ounce can, so I needed a half cup of regular water to give me 2 cups total. You could divide the water any way you’d like, as long as you end up with two cups of liquid for the full recipe or one cup for half. Adapted from Kimberly Snyder’s blog.